Four weeks ago I wrote how some of us had picked a patron for the year, and I got Paul the Apostle, with whom I plan to journey this year. 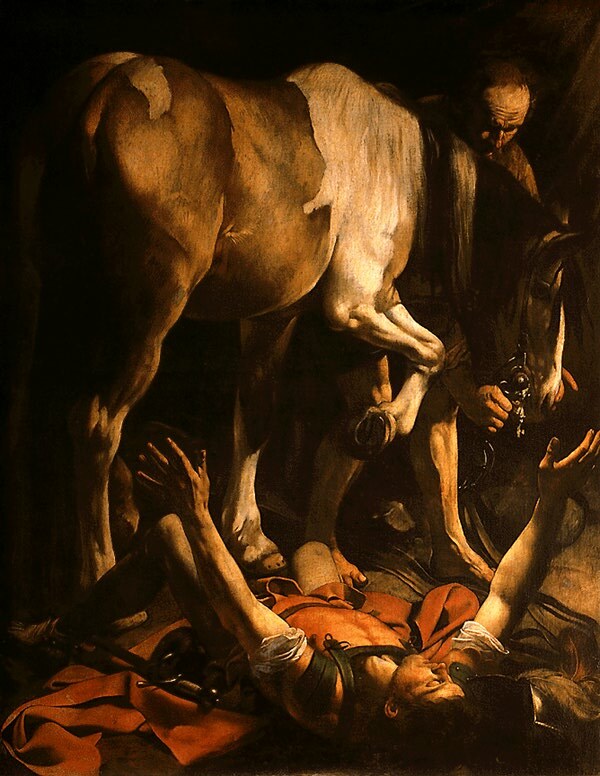 With this in mind one of my sisters recently sent me this painting of today's feast, the Conversion of St Paul, by Caravaggio, commenting on how much Paul looks free, at peace and filled with God. It's true: there's no tension in his body; he looks relaxed, dreamlike and surrendered. It's an interesting way to depict something which is generally understood as filled with terror and drama. Flashing lights and a force which throws you to the ground, your victim's reproachful voice from heaven, instant blindness - any one of these would be terrifying enough on its own; and yet Caravaggio gives us peace and surrender. Maybe whatever Paul saw and heard was dramatic, but not at all frightening... maybe the blindness was simply because he had been dazzled by the searing light of truth... maybe, in that awesome, blinding, heaven-opening moment, he looked on the face of God and knew... and said yes. And maybe in our fascination with the drama of this story we run the risk of forgetting what Caravaggio clearly understood: that in a conversion as deep and enduring as Paul's we say yes not because we are terror-struck, but because we are in love.